Starting with the KT66 – because it was the most ‘British’ power valve he could think of – and cathode biasing for even-order harmonics, Fantana developed his ideas from there. Rather than trying to recreate the sound of a specific amp, Chris was striving to achieve a certain feeling and dynamic response. The result is a hand-wired, single-channel 30-watt combo with a Warehouse BlackHawk 12-inch alnico speaker in a plywood cabinet. As a concession to modernity, there’s a bypassable solid-state effects loop, along with a master volume and a full complement of tone controls. 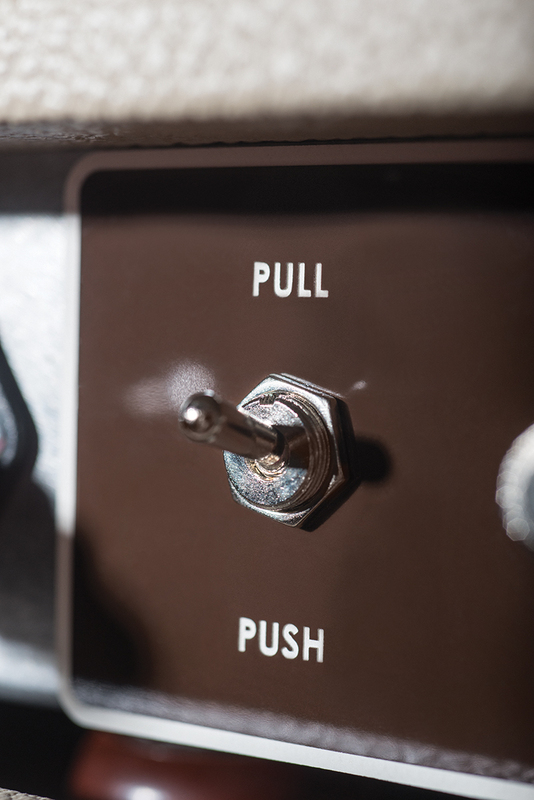 A front-panel switch drops the power to eight watts by routing one leg of the post-phase-splitter signal to ground, while the unused KT66 continues to conduct current. This clever method maintains the correct output-impedance relationship and the hum-cancelling of a regular output stage, while promising attenuation without tonal compromises. The Hawker’s custom-wound power transformer is also configured for two HT taps – allowing selectable valve and solid-state rectification via the rear panel’s two-position toggle switch (‘push’ being solid state and ‘pull’ being GZ34), while maintaining the same operating voltages in both modes. The notion of ‘British’ tone means different things to different people, but there’s definitely nothing on the Hawker’s tonal palette that’s ‘American’. The key characteristics are a compressed, lower midrange growl that accompanies the onset of clipping, and an airy treble sheen that floats over the top without becoming ice picky. In clean mode, this treble characteristic provides Strat single coils with an almost acoustic prettiness. 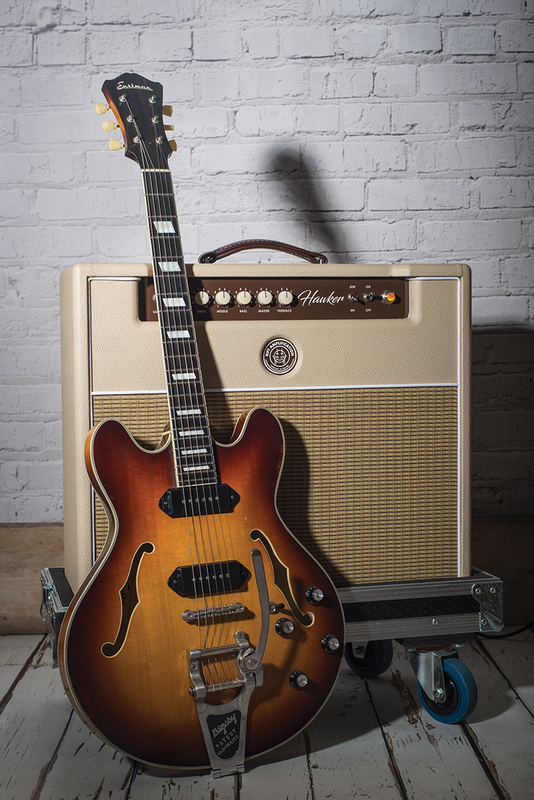 As the midrange thickens with overdrive, you do hear something closer to the throaty chime of a vintage Watkins or a Vox. The key to getting the most from this amp is to use your ears rather than your eyes when setting the volume and tone controls. That may seem like a statement of the obvious, but we often work on the assumption that nothing much changes between one and two or nine and 10, because that’s so often the case – here it isn’t. To illustrate, we continue with the Strat, max out the master and raise the volume. Almost immediately, the Hawker delivers a loud and full-bodied clean tone, and taking it a fraction higher, we’re into that hinterland of not quite clean and not yet dirty. Taking things a notch further, overdrive intensifies noticeably and the volume control has only reached two. We’ve lucked into a glorious tone, combining a midrange roar with lively upper mids and trebles. There is a delicious hint of ragged looseness in the lows, but it can be tightened up by rolling the master back to seven and compensating for level by raising the volume to around six. In doing so, we detect changes in the overdrive characteristic and dynamic response that occur because more overdrive is being generated in the preamp valves, while the power valves aren’t being pushed as hard. A thicker and gruffer midrange quality emerges, along with a narrowing of the dynamic range, as poppy attack eases into creamy sustain. Reversing our starting settings, with the volume now on 10 and the master around three, the anticipated wall of filth doesn’t materialise and instead, we get something far more interesting. The midrange actually begins to lose its girth and gruffness, which in turn allows the sound to breathe a little more clearly. You get all the crunch and singing sustain you might expect from a maxed-out preamp, but the lively dynamics return – along with even more detail and expression. Phew… all that and we haven’t even altered our tone controls! Reverting to a more neutral sound that’s just balanced on the cusp of overdrive, we explore the tonal range. Since the Hawker has a presence control, we start by determining how its effect differs from the treble pot. Both operate in a similar frequency range, but increasing the presence induces overdrive in the upper mids and makes the Hawker more touchy feely. For maximum cleans and the tightest response, we find it better to back off the presence and increase the treble. 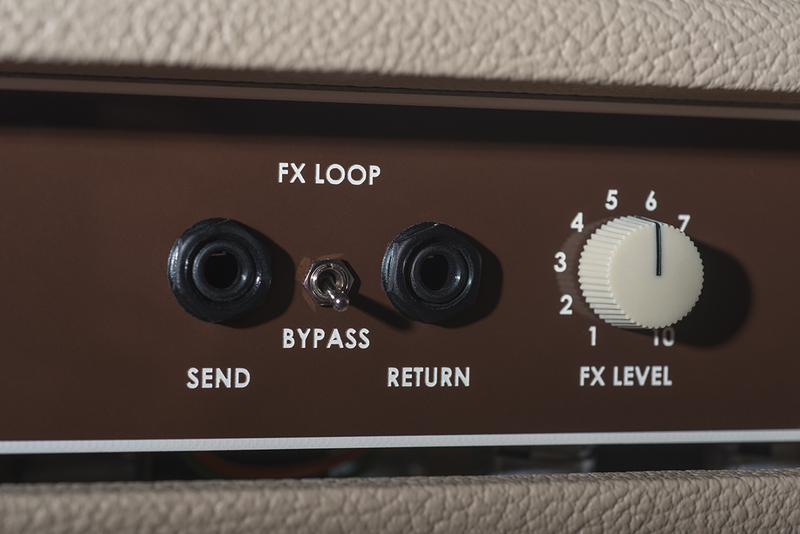 The tone controls are refined and have wide usable ranges – not unlike studio EQ – however, they are also highly interactive. For instance, rolling back the middle and cranking the bass creates a hotspot where the treble control’s response becomes very pronounced from six to eight – much like a fixed wah effect. 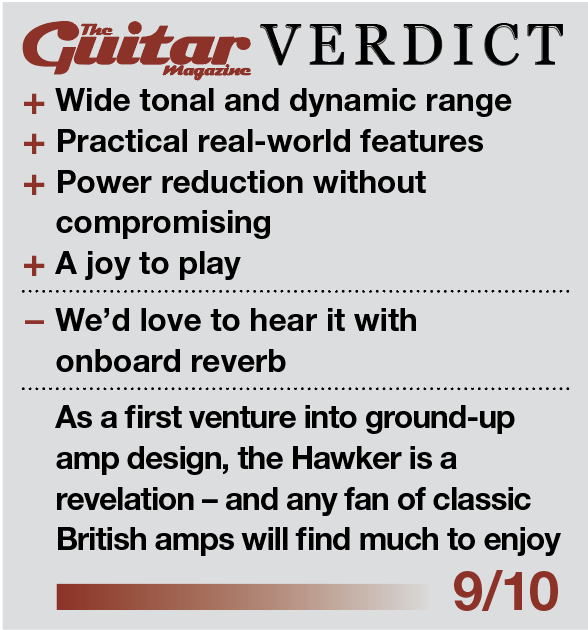 There’s no denying that the Hawker provides enormous scope for gain and tone sculpting, so next our attention shifts to its other features. The 30-watts/eight-watts power switch certainly lives up to Rift’s promises and we think the two power options are just right. 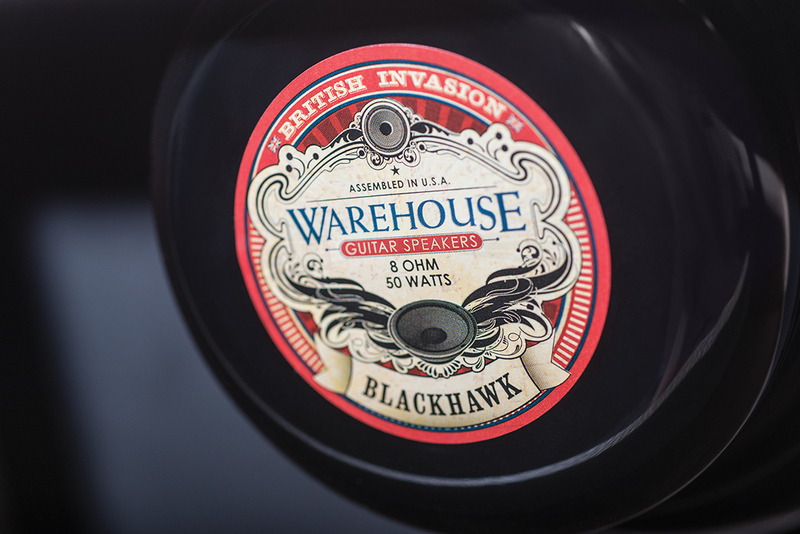 30 watts will get you heard in most situations, and eight watts through an efficient driver (such as the Hawker’s 100.08dB Warehouse BlackHawk Alnico) is about as much as you can use at some venues these days, before the sound engineer starts complaining. Since the Hawker comes with a very efficient speaker in a sizeable cabinet, both settings sound bigger and louder than their wattage ratings might suggest and they produce essentially the same sound at different levels. If you do need to tweak the tone, the controls comfortably deal with any perceived discrepancies. The switchable rectification’s effect on tone is fairly subtle, although you may detect a tad more treble in solid-state mode. 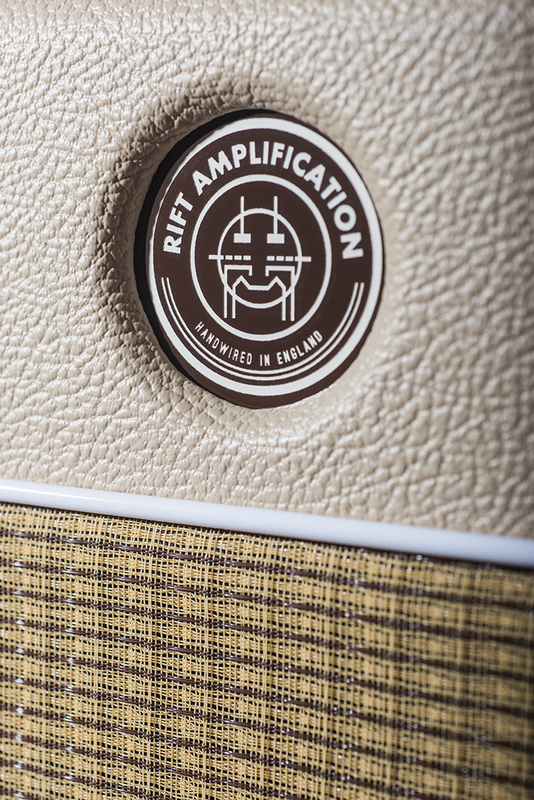 It really makes its presence felt on low-end definition and dynamic feel, but we have no clear preference, because selection depends on amp settings and volume. 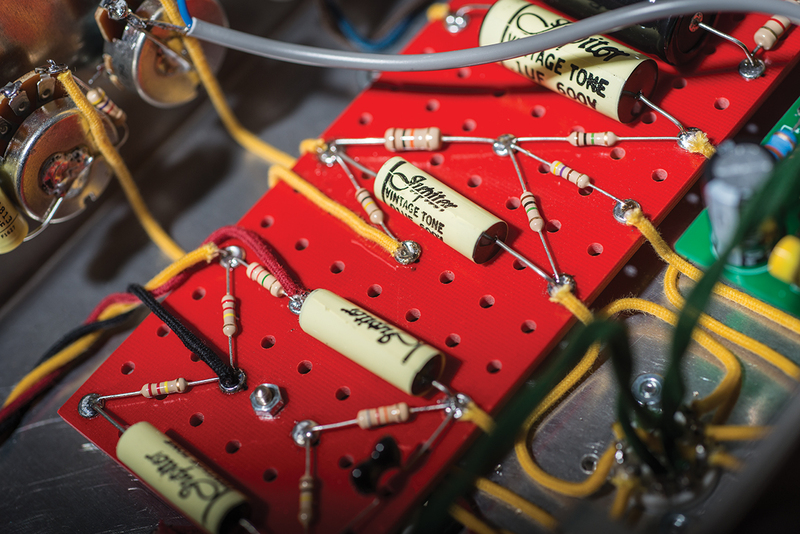 When pushing the output stage hard in eight-watt mode, diode rectification tightens the lows and prevents things from sounding overly compressed. Conversely, tube rectification at higher volume and lower master settings enhances touch dynamics and keeps the Hawker feeling responsive. Besides some roughness on the Tolex corners and curves that can be put down to this being a prototype, the build quality, style and sound all impress. 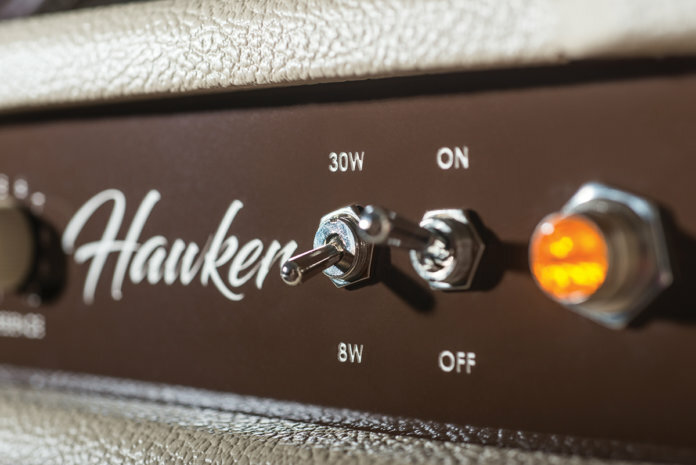 The Hawker has the smoothness, sustain and dynamic response of the best hand-built amps, and a price to match. It combines a raft of practical features and surprising versatility with a distinctive voicing, and more than holds its own at the top level.